Spring has sprung here in the Northeast... but you'd never know it! Although a strong chill still haunts New England, warmer days are not too far off - so let's celebrate by exploring some new "listening material" from MSR, on the ever-glorious Compact Disc. 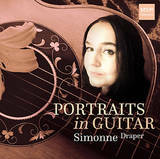 Newest of the New is an intoxicating album of PORTRAITS IN GUITAR by Simonne Draper. Featuring soloist-composer Simonne on guitar, joined variously by synth strings and percussion, the music is sensuous and sophisticated; not typically "classical" at all. Owing to the tremendous appeal of the songs, performances and audio production, it is the kind of disc one puts in the player and listens to every day for weeks before switching it out. 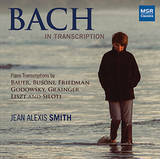 Also just in the door is BACH IN TRANSCRIPTION, which features a brilliantly coherent program of music transcribed for piano by no less than six composers. American pianist Jean Alexis Smith gives performances of great poise and assurance in another future favorite. From worldly exoticism to 17th century elegance we move to the great outdoors for RENDERINGS, a "pictorial" program of music for violin and harp. 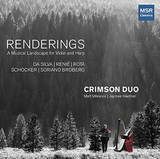 The Crimson Duo - pianist Matt Milewski and harpist Jaymee Haefner - partner with composers and a gifted visual artist, Luke Mislinski, to connect music with imagery. Hearing the music within the context of the images is enlightening. Fresh out of the box is CHILDREN'S PALACE, a collection of music for winds and piano by American composer PAUL REALE. The performances given by The Borealis Wind Quintet, both an an ensemble and as individual players are extraordinary, as is the pianism of Christopher Guzman. Reale's fascinatingly tuneful and colorful music is destined for a place in the standard repertoire of the genre. Just in the door is PORTUGUESE PERSPECTIVES, a collection of lively, tuneful music for oboe, piano and strings by composers from Portugal. Oboe soloist Courtney Miller and her musical collaborators play with a special blend of warmth and clarity. In a similar vein is TIME PLACE SPIRIT, which features works for flute and piano by composers who paint beautiful scenes in music. Flutist Beth Chandler and pianist Paulo Steinberg give deeply compelling performances. Also just released is a recording by the Repast Baroque Ensemble of their brilliant new arrangement of the GOLDBERG VARIATIONS by J.S. Bach. Originally composed for keyboard, Repast re-interprets Bach's great score with period flute, bassoon, strings and harpsichord. The arrangement brings about a stunning new understanding of the work. Robert Oppelt & Friends | THE DOUBLE BASS - ENCORE! Stay tuned, and remember to Turn. It. Up!